The Communist Party of the Philippines killed hundreds of its own cadres in a wave of paranoia that swept the rebel movement in the 1980s. In the 1980s, the Communist Party of the Philippines (CPP) and its armed wing, the New People's Army (NPA), undertook a series of "purges" of what it perceived were military infiltrators within its ranks. The purges resulted in the arrest, detention, torture and killing of hundreds of communist cadres suspected of being undercover military agents. 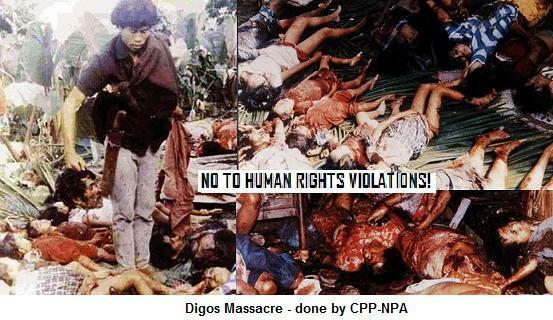 In Mindanao, an estimated 600 to 900 were killed in what the Party called Kampanyang Ahos, an "anti-infiltration" campaign that took place from 1985 to 1986. In 1988, 121 cadres were tortured and killed in an NPA guerrilla camp in the Sierra Madre, in what was known as Oplan Missing Link. A similar operation, called Olympia, took place in Manila at about the same time, later becoming a full-blown national campaign against "enemy infiltration." Robert Francis Garcia was arrested and tortured in the course of Oplan Missing Link, which began with a failed guerrilla operation in Southern Tagalog. Party cadres attributed the failure to military infiltration and formed a task force to round up suspected "enemy agents." Under interrogation, the suspects yielded no new information, so the task force resorted to torture. To appease their captors and save themselves from further pain, the suspects resorted to making contrived confessions. 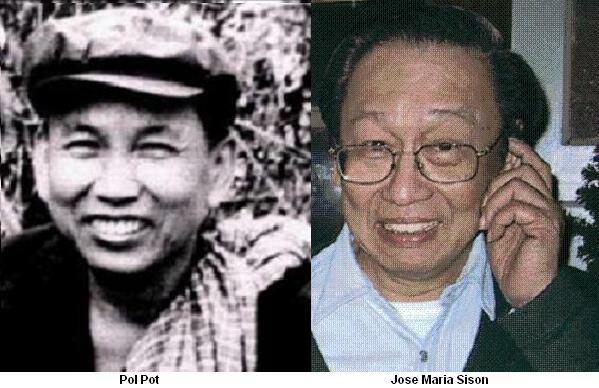 Their false admissions of being enemy spies fed the paranoia of ranking cadres and led to a spiral of arrests, tortures and killings that ended in November 1988, when the CPP central committee reviewed the purge and ordered the release of the detainees who were still alive. Garcia was one of the survivors. In 1995, he wrote about his ordeal in a first-person account published in this magazine. In To Suffer thy Comrades, a book that will be released by Anvil Publishing later this year, Garcia provides a riveting account of the purge and situates it within the context of a revolutionary movement that was nobly motivated but also tragically flawed. The book grew out of a study he did for the University of the Philippines Center for Integrative and Development Studies and was supported by the Institute for Popular Democracy and the Popular Education for People's Empowerment, where Garcia was executive director and still a member of the board. Suffer thy Comrades goes beyond Garcia's narrative of his and other survivors' harrowing experiences and explains why the purges took place, how both torturers and victims coped and made sense of their plight, and how they survived in the aftermath of the purge. The book sheds light on the darkest and deepest secrets of the revolutionary movement and provides insights that are useful now that the communists are negotiating peace with the government. TORTURE had never really been standard practice within the Philippine revolutionary movement, even within the ranks of the New People's Army. While it is true that guerrillas engage the military in armed hostility as a matter of course, this is within the context of a raging war and mostly within the parameters of international rules of combat. The NPA has always dealt carefully with prisoners of war and trumpets the fact that it adheres to the tenets of the Geneva Conventions. Part of this, of course, was propaganda, but the other part was a genuine desire to prove sincerity in struggle. It is thus the cruelest of ironies that the only time communist revolutionaries used torture was with their own comrades. Arguably, the military employed more sophisticated torture methods (electrocution, water cure, "ice" treatment, and so forth), but the rebels' interrogation techniques cannot be considered benign. One of these is popularly known as the "good cop-bad cop technique," which is designed to weaken a victim's defenses through psychological manipulation. One interrogator plays the role of the rough and brutal torturer who employs cruelty and physical attacks to pry out information. The other plays the nice and sensitive partner who treats the prisoner well and begs and cajoles him to talk so as to ease the suffering. Joey, a victim of an earlier purge in Northern Luzon, had a first-hand experience of this on his first day of interrogation, "with one interrogator offering me cigarettes and food while pleading with me to 'cooperate,' and another beating me black and blue." One thing we observed during Oplan Missing Link was that our captors could not really play the "good cop" role to the hilt as everyone was expected to be "bad." There developed an unwritten "policy of cruelty" that everyone was expected to observe. Some would attribute this to the "collective paranoia" that infected everyone, from the highest-ranking official to the lowliest guard. There was at least one exception to the contagion of cruelty: Ka Jerry, a member of the Oplan Missing Link task force. I knew him way before as the typical senior cadre who took revolutionary principles to heart. I still remember him sporting unruly hair and a bushy moustache. He always had that famished, emaciated look, but he was constantly ready with a hearty laugh and a joke or two. At the Southern Tagalog purge, he refused to be drawn into the whirlpool of violence. While he participated in the investigations, many attested that he never lifted a finger against any captive. That may have been his undoing as he soon earned the suspicion of the other task force members. Ka Jerry was himself eventually investigated by the task force; some detainees told me that his investigation was "fast-tracked" because the officers sensed that he was cooking up something, possibly an escape plan or a mutiny. He was detained, tortured and eventually executed. The fact that he was the first cousin of one of the leaders of the purge did not help him at all. FOR THE rest of the task force members, it was all a matter of keeping in step and learning by rote. Various forms of cruelty were developed. The standard methods of torture were mauling, slapping and the more imaginative "flag ceremony" where the victim is made to stand with her wrists tied together while she is hoisted up from the ground. This can last a few hours to a few days. There were other forms of brutality. At times, they slit the captives' skin with a knife or shaved off their eyebrows for fun. Sometimes, the victims' legs were forced apart and the torturers sat on their thighs. Other times, the torturers seared the skin of their victims with a lamp. They also experimented with various combinations of physical and psychological terror tactics. Cecil described how they hit her, hung her on a tree, showed her how they beat up other victims, undressed her and made her listen to the taped voices of her children. This last tactic is reminiscent of the Bolshevik revolutionary Nikolai Bukharin's prison experience under Stalin. We were treated cruelly not only by our interrogators and their subordinates but by the detention guards themselves. Many of these guards used to be shy and gentle guerrillas, but they believed they needed to be "proactive" to prove their worth and to avoid suspicion. They treated us with revulsion. They cursed and shouted at us, made fun of everyone and inflicted punishment whenever they pleased. One of the worst punishments we endured was the denial of food. We were fed just enough to keep us alive: no more than a teaspoonful of rice at mealtime, although there were times we were not fed at all. The rain was partly a blessing, as we could drink from pools of collected water. All of us became all skin and bones in a matter of time. During idle moments, we dreamt of food, getting delirious with the mere thought of eating. We spared not a single grain of rice. Some begged the guards for their leftover fish tails and bones. To our minds, the choices had been narrowed down to either owning up to the accusations against us or enduring the suffering until we died from it. By the time it was our turn to be interrogated, those who had undergone the ordeal before us advised us to own up, concoct a tale early in the game and spare ourselves further from suffering. "I was brought to the execution site together with a handful of other detainees. At that time, my senses were almost deadened by the torture I had received. I could barely feel anything anymore. But what I saw brought me new shock and completely erased any hope I had that all this would turn out alright in the end. "One of our companions was brought in front of us. They then turned him around while we waited in suspense. Next thing we knew, the back of his head was hit with a large wooden club. He fell down, then shouted: "Wala akong kasalanan, mga kasama!" (Comrades, I'm innocent!). He repeated this line incessantly, as if in a chant. He was groggy but was still able to stand up. Again, he was hit on the same spot but he remained standing. With the third blow on his head, his skull cracked open, and he lay dead on the ground. "I wasn't able to utter a single word after that. It would have been more bearable a sight if they shot him or even stabbed him, but this was such a gruesome spectacle. At that point, all my defenses broke down and I decided to spin whatever story I could think of." OUR BIZZARE situation brought us to a state of emotional turbulence, something probably approaching derangement. In a feeble attempt to capture that state in words, I outlined them in a rough set of what I refer to as "emotional phases." The reality was by no means linear as this might suggest, nor does this mirror the entirety of emotions. It merely approximates the volatile emotional state each of us went through at the time. The first stage was the inevitable shock. As revolutionaries, we were by and large psychologically prepared for danger, but we were totally unprepared to experience such suffering from our own comrades' hands. After we got over the initial shock, we were then consumed by either rage or fear. Because of the proximity of pain and death, more of us were gripped by fear compared to those consumed by anger. Moreover, our interrogators had very little patience to indulge outbursts of rage, and they dealt with these swiftly and decisively. The fear or anger soon gave way to bouts of depression, regret and self-pity. As Cecil said: "I felt sorry for my life. I often went back to how I began getting involved with the movement, how easily I decided and how quickly I left my family. I had so many struggles with them. My father beat me up. I chose the movement over my family and this is where I end up." "What have I done to deserve this?" lamented the others. "All my sacrifices amount to this?" Such were the depths of self-pity that many felt a growing emotional numbness and hardening of disposition. Although most of us were eventually freed from the clutches of self-pity and regret, our emotional state deteriorated into submission and fatalistic resignation. A kind of numb acceptance kicks in when your integrity is snatched away, your sense of trust is completely shattered and the possibility of pain and intimidation is constant and imminent. By then, our disempowerment was complete. "It's okay for me to die," said Cecil. "I already assumed I would no longer see my children. All I wanted was for my tormentors to eventually realize the truth behind this thing that I cannot for the life of me accept." "If I should go this way, then so be it," sighed the rest. Despite such fatalism, however, the instinct for survival remained strong. Amid our helplessness and despair, we found ways to carry on. Some resorted to faith, others to fantasy. Lina, who had always been a devout Catholic, went back to the traditional form of prayer: "I prayed three 'Our Fathers,' three 'Hail Mary's,' three 'Glory Be's.' I prayed when they were about to kill me. I think I felt a miracle - I saw some light and sensed some warmth above: I felt some sort of a halo. I said to God that I don't want to die this way, and hope that I could help in fixing this problem." I remember spending nights in detention listening to the prayers murmured by my companions. I managed to quietly follow on, calling out and invoking: "Lord, if indeed you're really out there, please help us." "At the pen-pen site, some were killed and some were spared—the latter brought there for the desired terror effect. We were all asked to say our last words. Almost all said, 'Don't let our parents know that our comrades did this to us.' One of us was quite combative. He spit on the guards and tried to kick them. His neck took the first knife. "I was brought to the pen-pen session more than once and was witness to a variety of ways of killing human beings. They forced us to look. One was strangled from behind using what they called the "marine hold." At one time I looked away - I just heard the victim scream like a pig being butchered. He struggled for air. He was kicked in the face. His color had already darkened but he was still alive. His last words were: 'Maglagom kayo, mga kasama!' ("Comrades, learn your history!"). He was stabbed and his blood was smeared on my face." Apart from those who refused to "confess," the candidates for execution were those who "talked enough." As they had said everything the interrogators needed to hear, they had no further use. We were not aware then that our captors had already decided that all of us were going to be killed. They told us that "rehabilitation" awaited us if we cooperated completely. This was, in fact, another interrogation tactic they employed: the peddling of hope. Most of us bought the idea of "rehab" because there was little else to cling to. It offered a certain chance to go on living, a glimmer of hope. Some captives were even marched off to rehab, to the wide applause of guards and other detainees. It was confirmed much later that they simply marched to their graves. Not all detainees bought the rehab hoax though. Some detainees were former interrogators themselves, like Ka Igan, who was notorious for his viciousness in interrogation and torture. Many detainees were glad that he was also arrested. He went through the same procedures he brought upon the earlier victims. He thus knew all will be killed eventually, rehab or no rehab. It took a lot of convincing for him to be disabused of his fear, even after the purge had ended and we had been unchained. Only when we were on the road to our homes did he come to believe that, truly, we were finally free.